*There are only two classes per week and they are each 45 minutes long. You will need to be fully wrapped up with hand wraps and have either boxing gloves or MMA gloves on! Our gym always opens a half an hour before any of our group classes and we have an in house Pro Sales Shop if you need wraps or gloves FYI. 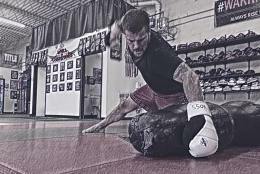 The program will give you a great work out that burns tons of calories but you will also get top notch instruction on proper form/technique when it comes to BJJ/Wrestling positioning as well as striking. This program will be great for anyone/everyone when it comes to adults. Cost - Just $10 a class or you can sign up for our Fitness package which includes the Combat Conditioning classes as well for just $40 a month! Classes run on Tuesdays and Thursdays from 5:30 - 6:15! I started coming to Griffinrawl right after my high school sports ended. I wanted to try something new and compete a little bit(even though I new nothing). After the couple months of training I was hooked. I loved being able to train hard, have fun, and learn new things. While being here I was also given the chance to compete. I have never competed inside the ring before and that was a new experience. I honestly think that griffinrawl helped me show case my abilities and pushed me to get my first ever victory. It is a great gym and feels like home. Proud to say I'm from Griffinrawl! I got into kick boxing when I lived in Oregon. As i prepared to move to Ohio the first thing i did was look for a new gym to continue learning from and working out at. GriffonRawl was one of the top gyms to pop up. I messaged the gym and heard back quickly. Once i moved i joined the Combat & Conditioning class. The coaches are encouraging and will push you farther than you think you can go. Everyone is friendly and care about everyone. I recommend this gym to anyone whether you want to become a fighter or just train like one.